Certified Brake Maintenance Near You! As you’re driving, there is nothing more important than being able to safely bring your vehicle to a stop. High quality brakes are essential to keep your vehicle safely running, therefore, it is key not to purchase refurbished or off-brand components. When you rely on our team for Toyota brake service and maintenance, nothing but genuine products will be implemented. Each piece is specifically designed for your car, truck, van or SUV and built to the same high standards as the original parts. Whether you are in need of calipers, rotors, brake pads or drums and shoes, our professionals will have your vehicle running safely in no time. 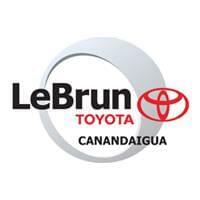 Schedule a Toyota brake service, inspection or repair at LeBrun Toyota to reassure your brakes are in mint condition! Looking for Scion brake repair? Our team will utilize Genuine Toyota Parts to keep the high quality your vehicle originally obtained.